Last week I posted and introduction to color theory by introducing the color wheel and its components. Today, I thought I would follow up with a post about complements or complementary colors. Two colors are complementary to each other if when mixed together in equal amounts the resulting color is a neutral gray. 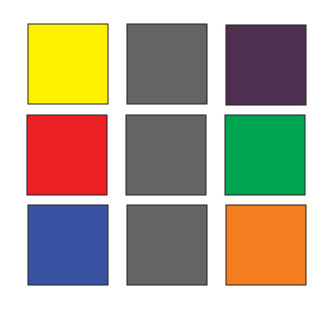 As I mentioned before the complement to a primary color is a secondary color, the secondary color is made up of the other two primary colors. For example, the compliment of red is green, which is a mixture of yellow and blue. 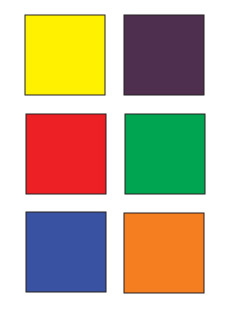 The other compliments to the primary colors are; orange complements blue and purple complements yellow. But the complementary relationship doesn't apply only to the primary and secondary colors. Any two colors mixed together that create a neutral gray are considered complimentary colors. To figure out which colors are complementary the color wheel becomes very useful. The colors that are directly opposite of each other on the color wheel are the compliments of each other. 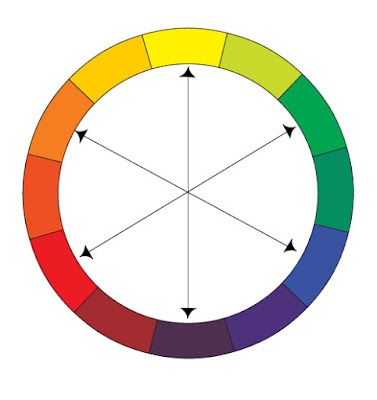 That is to say, if you were to draw a line from one color through the central axis of the wheel to another color you will find the color that is complementary to your chosen color. You can do this with any color on the wheel. On reason complementary colors are useful is the knowledge that when mixing the two compliments equally you will end up with a neutral gray. This tells us that if we mix the two colors in differing amounts we are making colors that are moving closer and closer to gray. This is one way of muting colors or lessening the intensity of a pure color. The chart below illustrates the gradual progression mixing varying amounts of the two compliments together, in this case red and green. Mixing a little green with red reduces the intensity of the color. The same applies to the other side, adding a little red to the green calms the color's intensity. Continuing the process, gradually mixing more and more equal amounts of each color together you will neutralize the both colors and eventually have gray. There is much more that is useful about working with complimentary colors. Complementary colors have a dynamic relationship and can be used to create balance or tension. 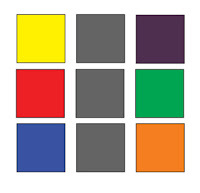 Many artists use complementary color schemes as a guide their painting.